For over thirty years, Town and Country Fencing has been providing specialist fencing to the construction industry, rail sector, and public sector works including schools, infrastructure and highways.Â We work within a one hundred and twenty mile radius of our North Shropshire head office. We provide installation and repair of acoustic and environmental barriers, security fencing, sport- ball stop fencing, temporary hoardings, and other fence products and materials including timber, metal, vertical bar, palisade, chain link, mesh panel and concrete. 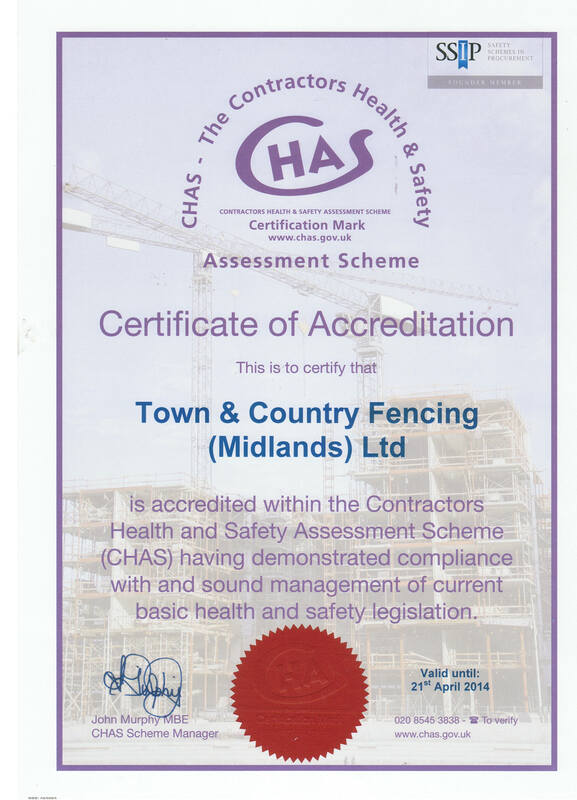 Town & Country Fencing understands the stringent requirements of public works, private sector projects, and civil engineering and so we carry the required accreditations for the supply and erection of commercial and industrial fencing. All highways work is done to HCD specification and all TCFâ€™s own suppliers are vetted to ensure they are certified and accredited to the levels required within the sectors we serve. For every business security is a critical feature of protecting land and assets so TCF has found itself recently taking more contracts for improved security from public and private sector clients. Security can be a sizeable investment for an organisation depending on the scale of the assets and estate being protected, but is always heavily weighed against the cost of loss, disruption to the business activities, loss of work throughput and revenue, and higher insurance costs. You may consider it part of your business continuity plan to protect anything highly valuable or vulnerable. TCF has a vast experience in providing security fencing and protective boundaries and enclosures for national, regional and local names in public sector, commercial and retail, so we can make a site visit and work on a bespoke specification for your organisation, or to a preferred design provided by you. We can work to different acoustic and security requirements and can provide a wide variety of materials and finishes â€“ from timber to steel, from long-term wood treatment to anti-vandal paint. You will see from our photographic portfolio that any security requirement can be provided utilising any of our existing materials, designs and finishes â€“ which give you a good visual indication of what you might be looking for. TCF works to numerous high level accreditations, including our latest which is the nationally recognised Constructionline. Contact us during normal office hours by email or phone.Â Â Details on our contact page. Contact us today today for further infomation. National Highway Sector Scheme 2A and 2C, BS 1722.